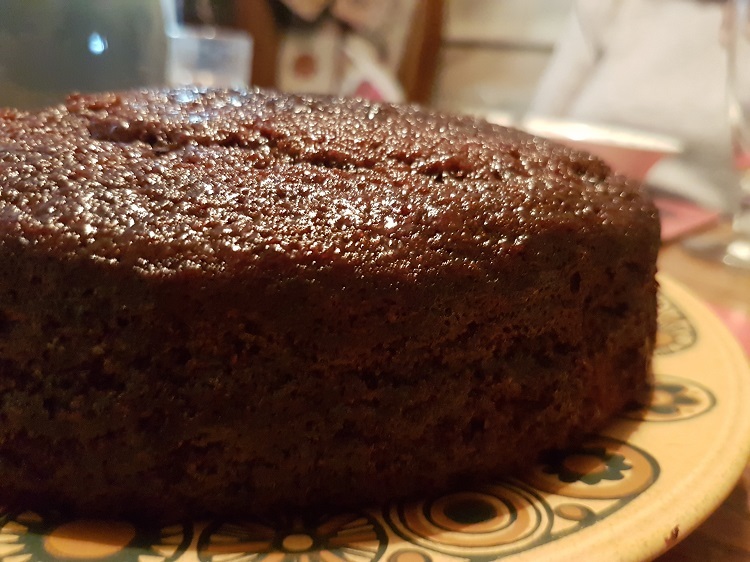 This sticky ginger cake can be eaten warm with custard/cream/ice-cream, or at room temperature with a lovely cup of tea or glass or milk. Having said that, we actually ate ours at room temperature with hot custard, so really, eat it how you like! It’s super-easy to make and has definitely made its way on to my favourite recipes list. Its sweet spiciness makes it ideal for winter, especially around Christmas time. It’s not my own recipe, I found the recipe on the Flora website, but as I often do, I made an amendment to it, which I’ll explain when I get to it. * I wasn’t too sure about using the Flora Cuisine as I’m generally a big fan of using proper butter; it’s more natural and (in moderation) I believe is better for you than some of the other types of more processed oils/fats. Plus, let’s face it, it tastes better. 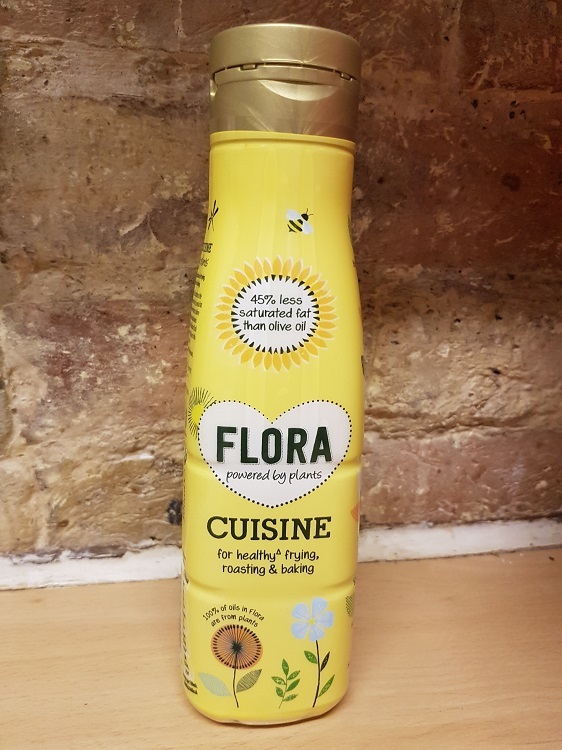 I hadn’t used Flora Cuisine before but as it is a liquid and I wasn’t sure if substituting butter would give the same results. And as I was using their recipe, I felt it only right to use their product. This probably unnecessarily long explanation is just to say that I recommend using the actual product they list here to ensure the same result! Melt Flora with the sugar, treacle, syrup and milk over a gentle heat, until the sugar has dissolved, don’t let it boil. Add the stem ginger pieces to the flour, pour in the melted ingredients, stir thoroughly, then add the egg and beat together. Now this is where I veer off from the original recipe. The original has a ginger frosting/icing recipe for the top or it says to just leave it. Instead, I did this – leave it in the tin to cool for about 20 mins, then with a thin skewer, make deep holes all over the cake. Now take the syrup from the ginger jar and spoon it over, encouraging it to go into the holes and seep down the sides, brush it all over the top also to give a good sheen. I’m not sure how much syrup I used, I just kept spooning, probably about 6-8 tablespoons. The reason for letting it cool a little before spooning on the syrup is because otherwise the syrup will likely go right through to the bottom. If you’re not eating it right away then leave it to cool completely in the tin before turning it out. If you want to re-heat it to serve, I suggest doing that in the microwave so that it doesn’t dry out, and only just warm it. Do you like ginger cake? Sounds good, but might not be beard friendly. I might need a bib. Maybe a glass of aiming fluid would help, now that you mention it. Rum, ginger syrup, etc. Yep, this recipe’s definitely a keeper! Yes, the combination of dark syrup and sugar and ginger is rather tantalising! I’ve never heard of the product Vanessa. I wonder if it is sold in North America? Do you mean the Flora Cuisine? It’s not a product I was familiar with actually until I stumbled across the recipe. It looks like melted butter when you pour it out, it’s basically a combination of oil and butter solids I think. There’s probably an equivalent over there. Yes that’s what I meant. I’m sure there must be something similar here. Oh I think you’d be alright, the syrup doesn’t make it too wet so I don’t think you’d be dribbling :). Its just like when you have a lemon drizzle cake, the syrup just gets soaked up by the cake to make it nice and moist and flavorsome, but it doesn’t drip or anything! MMM. I’m used to eating gingerbread, not ginger cake, so I would probably love this. I don’t think we get that Cuisine stuff on this side of the pond. At least, I’ve never seen it. But I bet if you simply melted real butter to get that liquid proportion, the recipe would still work. Thanks for sharing!